I'm thrilled to be sharing a new addition from my favorite Holland bridal salon, September's Bride. Tami has introduced the Vintage Couture Collection by September's Bride and I think it's an amazing idea which West Michigan brides will benefit from. Tami Parks, owner of September's Bride, is always looking for beautiful vintage gowns. Some gowns she keeps for her own collection, and others, she cleans, repairs, sometimes restyles, and puts them on the sales floor at her delightful Holland shop. Recently, she came across a few brides who wanted to sell their high-end designer gowns. Previously, the only way to buy these gowns was the internet. 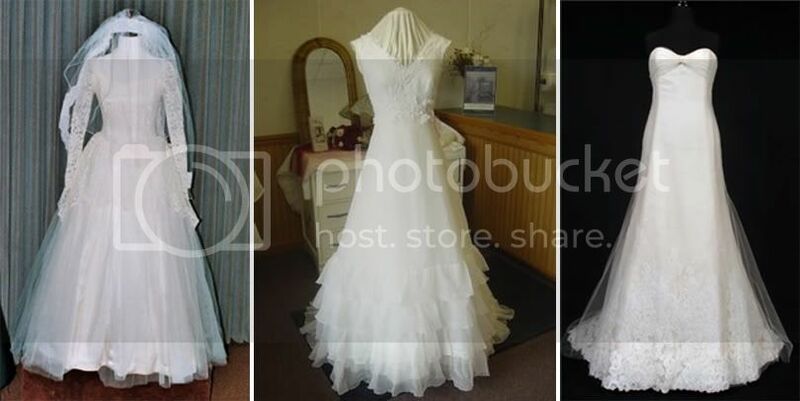 Now, Tami is offering a place to sell and buy a gently loved designer gown. This is perfect for the bride who wants true vintage or a once-worn designer gown, either for ecological or economical reasons! Most of the vintage gowns range in price from $99-$299. The designer gowns on consignment will vary in price, depending on the condition and original price. The Vera Wang "Una", above right, is in store now and priced at $3999.